Over time, sun exposure can damage and discolor your skin. These effects are most noticeable as areas of red or brown pigmentation, typically along your face, neck, chest, hands, and arms. As these areas of discoloration become more prominent, they can give your skin a less healthy, even, and attractive appearance. Intense pulsed light (IPL) therapy is a non-invasive technique for treating sun-affected skin. Dr. 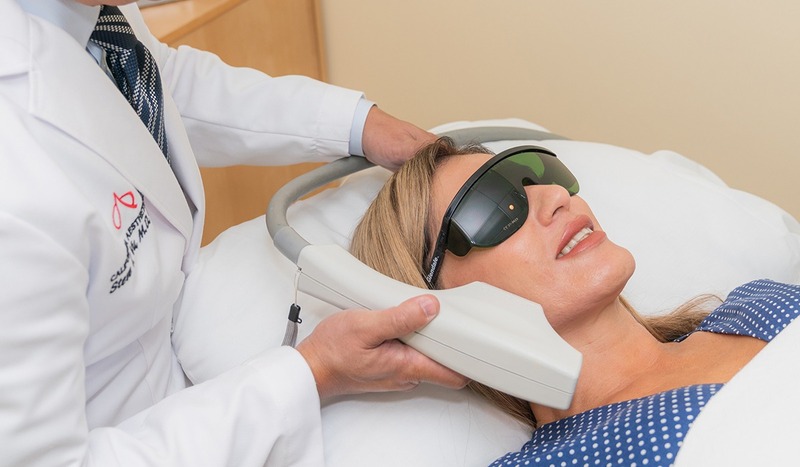 Vu employs the technology in his Huntington Beach practice, giving patients an effective option for reversing skin damage and discoloration. A board-certified plastic surgeon, Dr. Vu has over twenty years of experience guiding patients in aesthetic treatment and helping them achieve their personal goals. If you are exploring non-surgical solutions for resolving an uneven complexion, find out whether IPL photofacial can help with your needs. The IPL photofacial technology applies pulses of light energy that target the melanin (brown aging spots) of damaged skin cells. When these cells absorb the pulsed light, they become heated and, over time, absorbed by your body. As a result, areas of pigmentation become less noticeable and eventually fade away completely. Brown and red spots that are the result of sun exposure. Rosacea, a skin disease commonly marked by redness, breakouts, and swelling. Skin that has developed minor laxity over time. IPL photofacial can reduce skin discoloration that results from sun damage and rosacea. It can also provide a minor amount of skin tightening, restoring firmness and definition to your features. You should see the benefits shortly after completing treatment, which include improved texture and more even coloring in the areas of application. Dr. Vu typically reserves IPL photofacial treatment for patients who have up to Fitzpatrick Type 4 skin. Those with skin that is darker than Fitzpatrick Type 4 may require a more conservative approach because of the way that the technology works. Huntington Beach patients who have very tan skin should delay their treatment for several weeks in order to get the most from their care. Dr. Vu is committed to providing Huntington Beach patients with the information that they need to make the best decisions for their aesthetic treatment. During your initial consultation, he will take the time to talk with you about your goals, examine the areas that you want to treat, and review choices for your care. IPL photofacial can be an excellent option for addressing sun-damaged skin for all of the reasons previously discussed as well as for its advantages over other treatment modes. Still, you should know the alternatives, as they may provide benefits that better suit your needs. Skin lightening products. One of the other options is to use skin lightening products in the areas of discoloration. 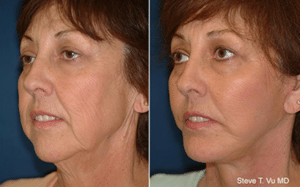 Like IPL photofacial therapy, this cosmetic approach is non-invasive. However, the products are inconsistent in the results that they offer and aren’t as predictable as IPL. In addition, skin lightening products can take a long time to achieve a noticeable result. Laser resurfacing. Dr. Vu provides Erbium laser resurfacing treatments in his practice. Laser technologies use a more powerful and focused beam than IPL to treat areas of skin damage. The therapy can be very effective, but it is a more intensive treatment, and you can expect a longer recovery time. Sometimes it may be beneficial to combine the IPL procedure and laser resurfacing procedure to maximize the benefit of each tool. Begin by scheduling your initial consultation at our Huntington Beach office. As part of your visit, Dr. Vu will conduct a skin evaluation, noting the areas that may have sustained sun damage. Patients mostly recognize these effects in the skin of their face, neck, and chest — which tend to get a high amount of sun exposure — as well as their hands and arms. Dr. Vu will assess these features and determine whether the symptoms you are seeing are treatable with IPL photofacial therapy or with another approach available through the practice. If you opt for IPL, Dr. Vu can typically apply the therapy on the same day as a consultation. This means that you will receive the care that you need more quickly and can enjoy the benefits of treatment sooner. Dr. Vu’s team will apply a numbing cream to the areas that he will be treating. This cream will reduce sensation in advance of IPL photofacial therapy, which makes the experience more comfortable for our patients. Next, they will remove the remaining numbing cream and apply a cooling gel. Dr. Vu will use a handheld device to deliver pulses of IPL energy. Dr. Vu can adjust the device to treat the entire face (or neck, chest, etc.) or to focus on a single spot. After the appointment, most of our Huntington Beach patients can return to work or normal activities, though you may prefer to take it easy for the rest of the day if you have had a large area treated. You do not need to apply any special ointments to your skin or take any medication after IPL photofacial therapy. Over the next 3-5 days, sun-damaged skin in the treated area will flake away, revealing healthy new tissue beneath. Features such as brown spots should lighten 60% to 90% with each application. Dr. Vu typically recommends that Huntington Beach patients with more significant discoloration or larger treatment sites have two applications spaced one month apart. You may also want to return to the practice for retreatment if the spots darken over time. IS IT PAINFUL TO RECEIVE IPL PHOTOFACIAL THERAPY? Dr. Vu takes several steps to make treatment as comfortable as possible for Huntington Beach patients, including his use of numbing cream and cooling gel during the process. Most of the people he treats describe the discomfort as a “2” to “4” out of a scale of 10. WILL THE SUN DAMAGE BE GONE FOR GOOD? IPL photofacial therapy removes layers of sun-damaged cells to reveal healthy new skin. The improvement you see should be permanent. However, ongoing sun exposure can cause these sites to darken again. WHAT CAN I DO TO PREVENT SUN DAMAGE IN THE FUTURE? Dr. Vu approaches care for his patients as an ongoing relationship and not just a one-time treatment. Part of this mindset is advising those he treats about maintaining the aesthetics of their skin over time. He can recommend a skin care regimen in line with your individual needs. WHAT PRECAUTIONS SHOULD I TAKE BEFORE AND AFTER IPL TREATMENTS? Patients should avoid prolonged sun exposure for two weeks prior to and two weeks after treatment. The treatment can cause hyper pigmentation or uneven pigmentation on tanned skin. Reverse sun damage and get more youthful, healthy-looking skin. Schedule an appointment for IPL photofacial therapy by contacting us online or by calling our offices in Huntington Beach at (714) 848-1133.